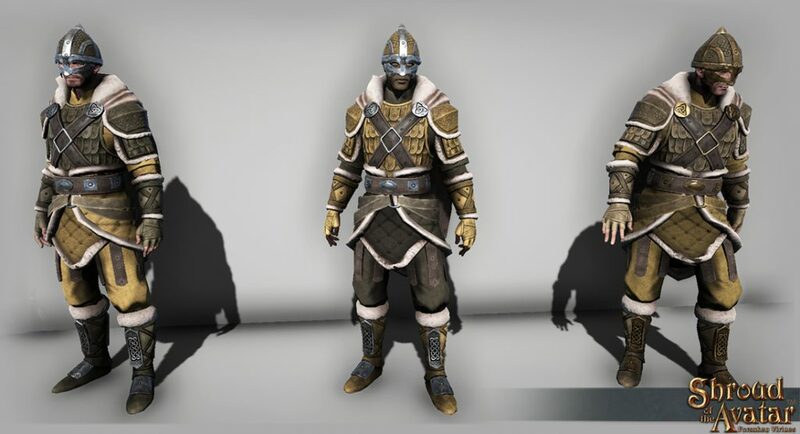 Update of the Avatar #239 – 2017.04.08: Etceter and South Paladis Scenes, Norgard Garments, Travian Partnership, Portalarium is Hiring, R44 Telethon, Dragon Con & PAX, Trailer Contest, and More! R44 Postmortem Mini-Telethon Aug 7! DragonCon Schedule: More Panels Announced! Weekend Flash Sale: Elven, Clockwork, and More! SeedInvest: Minimum Exceeded! Last Chance to Invest! Etceter was cloned from Kingsport originally and while we made significant changes to the scene to make it unique we still felt it needed more polish. It also needed more obvious visual references to the historical locations mentioned in The Sword of Midras (the prequel novel written by Tracy Hickman and Richard Garriott). Additionally after building Xenos we established a characteristic Greco-Roman ruins look for that region of the world and we wanted to propagate that look to nearby towns. For instance Aerie now has a “Little Xenos” quarter. Since Etceter is the main port that takes you to Xenos it only made sense that it should have some strong influences from that style. 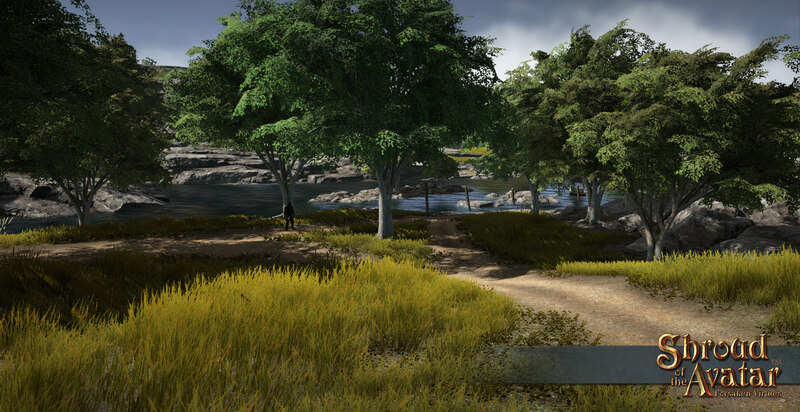 When commenting earlier in this post, I hadn’t had the chance to make a beautifying pass on the outer areas of the scene, such as the main entrance and edge conditions. 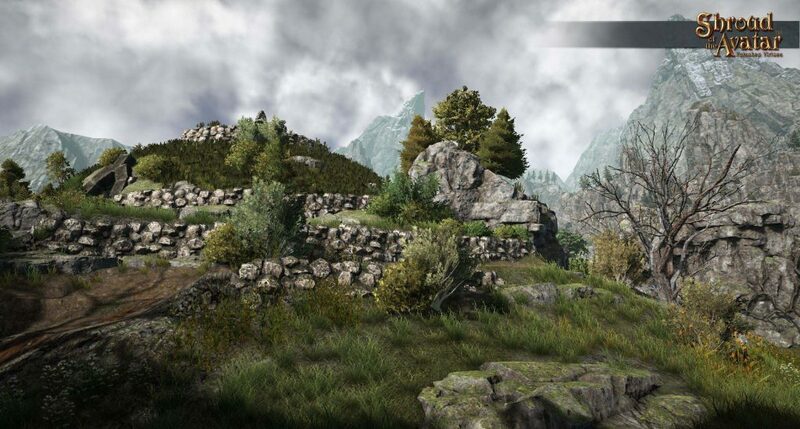 That has now changed, and as you can see by the images, one of my primary focuses was making sure that where areas of nature met areas of old construction and civilized development, there was a very “intentional” feel to the placement of natural objects and built structures. In these initial images you can see the remnants of these walls, which I have used to demarcate the roads more distinctly than they were before, and to beckon travelers toward areas of both commerce as well as the general entrances of the various estates scattered throughout the scene. In Etceter, for example, descriptions in the book (pertaining to Amanda’s cottage) indicated that chest-high walls often lined the edges of the town’s roads in various places. Since 200 years and an Obsidian occupation has taken its toll, these walls have fallen into disrepair and neglect, but are still a rustic reminder of Etceter in its heyday, when it had been a prosperous port flowing with the wealth of its mine, and rich trade from along the coasts of the Bay of Storms. It’s important to remember, when seeing these images, that though this was once a place in its prime, with a great degree of prosperous development and commerce, it has since fallen on hard times after the Obsidians invaded, its royalty was butchered, many of its houses destroyed, and with only a small population to keep it going even after the end of the wars (now including the dubious presence of satyrs and fauns). Etceter mostly survives today due to what little trade and travel occurs between it and Xenos. All the details I’ve added needed to indicate its past glory while still emphasizing its current state of “developed” decay. Hopefully you’ll all find my changes have provided some new excitement, interest, and immersion to the areas you now call home here! Of the many new qualities I wanted to capture with my additions to the harbor-side area was a stronger sense of commerce and connection between Etceter and Xenos. 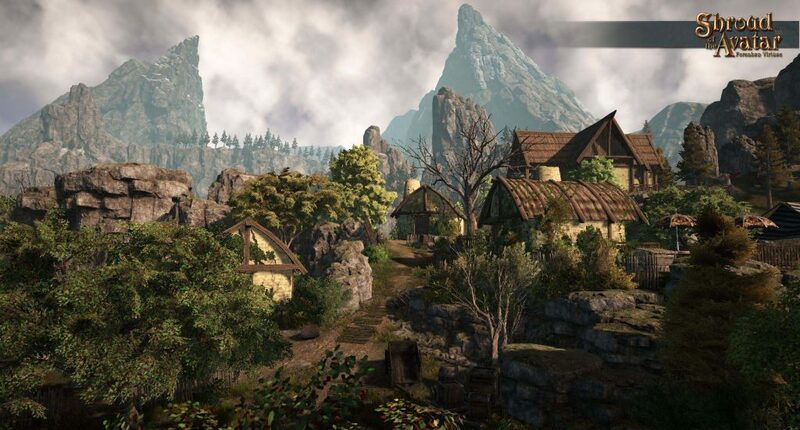 In these next few images I wanted to give a hint of the goods often traded here, especially since this is one of the few ports of call where passage to Elysium is easily acquired. Elysian amphorae, exotic rugs and fabrics, pottery, architectural elements, and decorative sculptures can be seen here and there along the docks, either waiting to be bought and sold, or already adorning some of the shops to be found here. Alleys and side-streets are no longer bereft of details, since some of these wares gladly spill over into them. The stone foundations of these portside buildings offer welcoming walkways where tourists stamp sand from their sandals (much of which gathers where the walls meet the granite pavers) before entering to sample the wares within! And with that, my little loving pass over Etceter is complete. Like I said, not nearly as extensive or dramatic as the changes I made to Xenos, but hopefully these simple touches will really tie the various elements of this scene together to help tell the story of its tumultuous history, as well as its present-day predicaments and concerns. I’ll now be passing this scene on to Dan to insure any changes I’ve made to the town and its environs are now reflected in the behaviors of the NPCs that inhabit it! 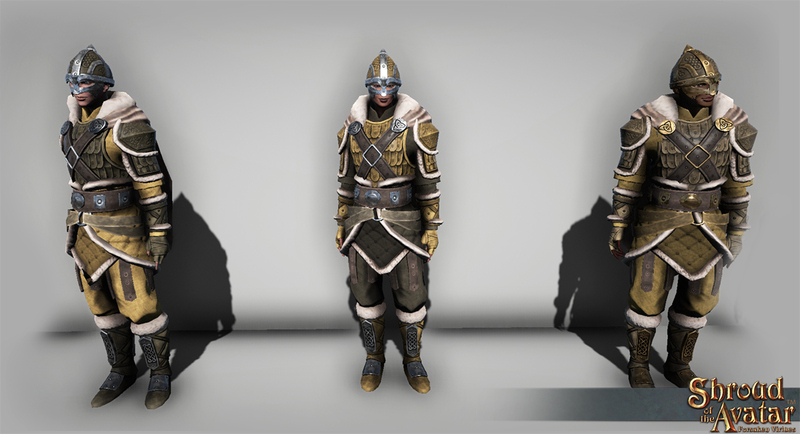 We have begun creating the Viking-inspired clothing for the NPCs in the Northwest regions of Novia, including Norgard and Verdantis. This will complement the already established architectural character of the region and help to better define the area as a whole. 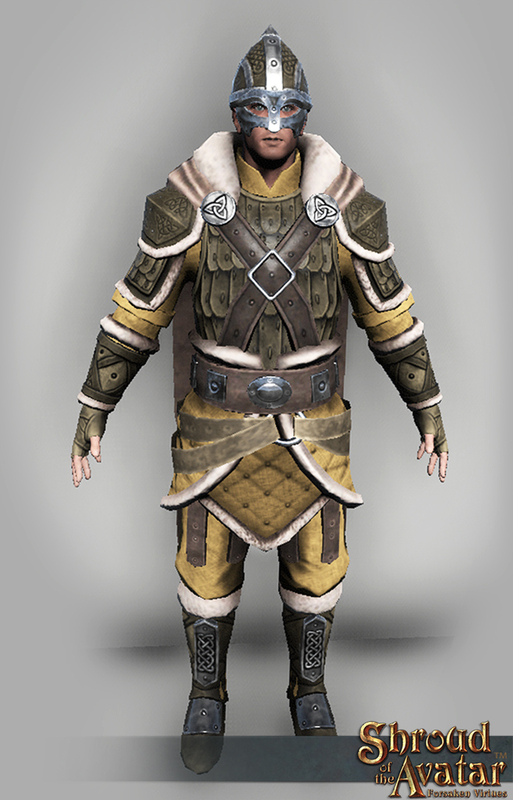 We are creating garments for Guards, Citizens, and Merchants/Nobility, all of whom “courageously” display the color yellow which everyone knows drives the Kobolds mad, or so they say. For Release 44 we updated the Guards in the region. In Release 45 we will update the other NPCs (Citizens, Upper Classes, and even enemies) in the region and we will create player wearable versions of these outfits. I finally took a few minutes to get some shots of Norgard guard stuff. All of this Norgard work is in-progress. I still need to make color adjustments, fur-cards, and more — but this is everything so far currently with the player wearable, and also guards’ gear. Feedback welcome as always. Thanks, all! We are focusing the next few releases on building the lower tier scenes near the cities along the paths of Truth and Courage. Most of these scenes have been clones of other scenes and will now be replaced with completely original scenes. 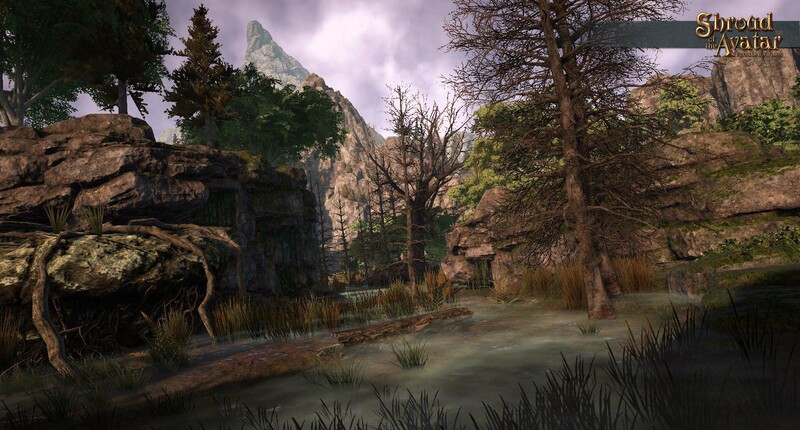 In Release 45 two of these scenes are in the South Paladis Region. Middle Downs is a hilly Tier 1 scene near the mountains with a network of burial mounds and an abandoned village. 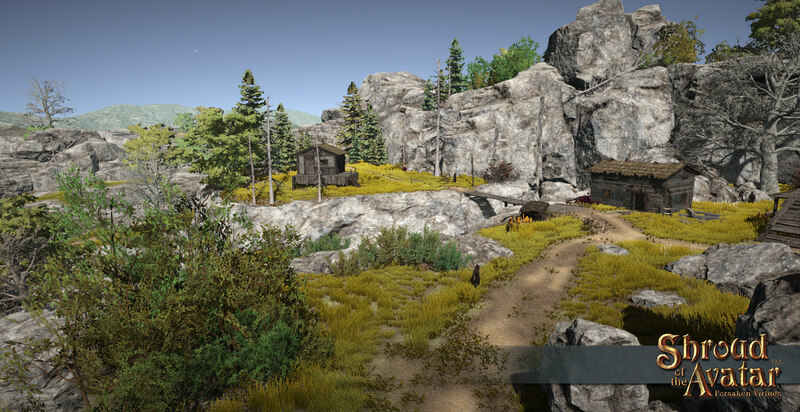 South Broken Road is a Tier 2 scene comprised of a winding road through the mountain full of various encounters including plunderers and undead. Hey guys! 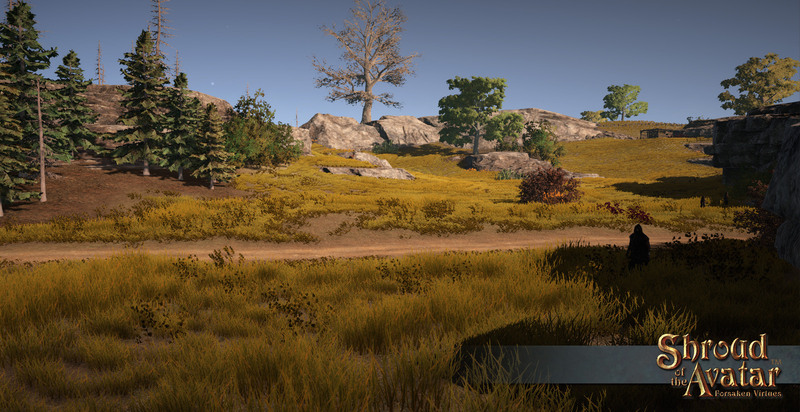 SorcerousSteve here to give you a sneak peek on my latest map, The Middle Downs! The Middle Downs are located in South Paladis just south of Highvale in a rolling hills region. Serene and peaceful the area is lush, but scattered throughout the region are mysterious burial mounds built hundreds of years ago. What mysteries do these burial mounds hold? Is there a link between their location/orientation and what puzzles/traps may lay inside? An abandoned village in the Middle Downs moments before sunset. Another burial mound located to the South. A lowland bog cuts through the center of the Middle Downs. Stay tuned for more updates on the Middle Downs! 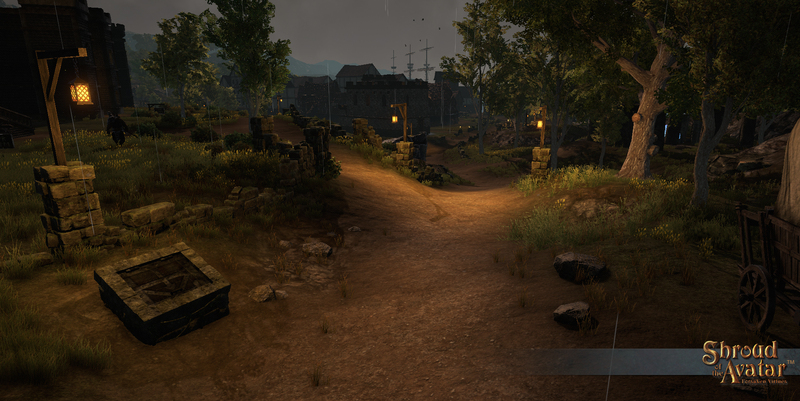 Here’s some sneak-preview shots of South Broken Road, a Tier 2 area between Opalis and Jaanford. Garret The Fabulous, longtime purveyor of fine hair tonics and plague cures, has gone missing somewhere along the South Broken Road. 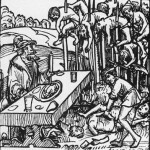 If someone were to find his wares untended, let’s hope they wouldn’t try to make their own mixtures. 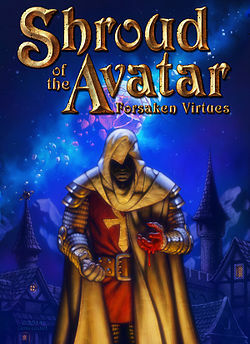 Shroud of the Avatar’s original crowdfunded campaign began in 2013. Currently with more than $11.8 million in crowd funding, Shroud is the second highest fully crowd funded game ever. 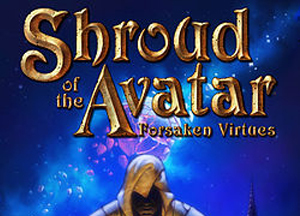 More information about the crowdfunding campaign and the game can be accessed at www.ShroudoftheAvatar.com . Disclaimer: Portalarium is offering securities under Regulation CF and Rule 506© of Regulation D through SI Securities, LLC (“SI Securities”). The Company has filed a Form C with the Securities and Exchange Commission in connection with its offering, a copy of which may be obtained here: www.seedinvest.com/portalarium/series.b . Press Release also published on Gamasutra and other websites. If you’d like to join the Portalarium Tribe working on the ground-breaking Shroud of the Avatar, please submit your resume to jobs@portalarium.com. 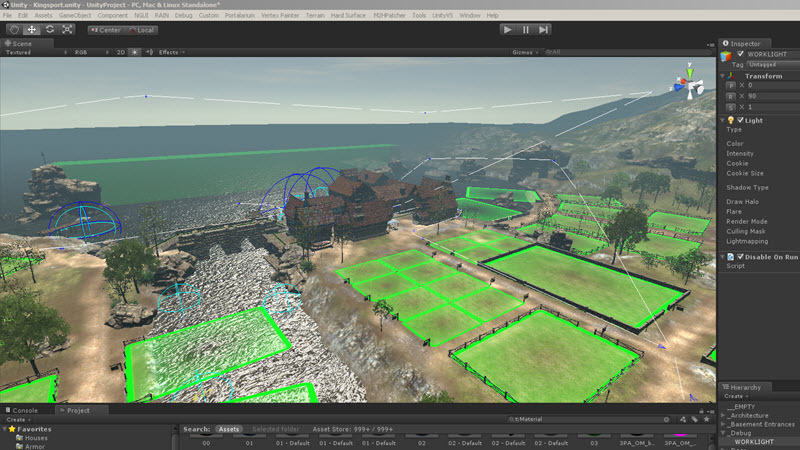 Provide links to your work (if possible), including actual game play, videos footage, and document form (images, maps, and event descriptions). Traditionally our Telethons have been held quarterly and lasted 12 hours (and in some extreme cases 24 hours!). While these lengthy telethons allowed us to cover a very wide range of subjects, they also led to a bit of meandering at the end due to fatigue (and maybe a bit of overindulgence). Recently we had a much shorter telethon (6 hours) for Lord British’s birthday, discovering that we spent more time answering questions and remained much more focused and alert. Your response was also quite positive in both pledges and feedback after the telethon! 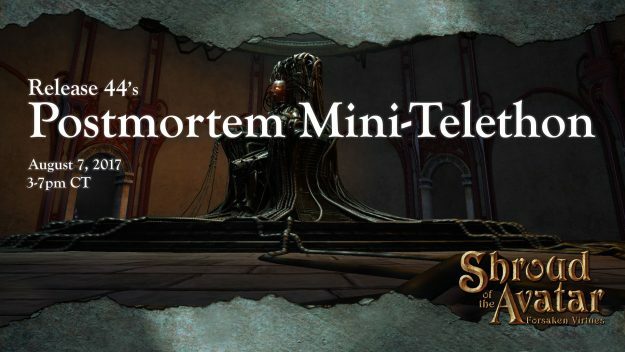 So, starting with Release 44, we are going to experiment with extended Postmortems that are also Mini-Telethons. This will increase the frequency of our telethons to monthly but also keep them short (4 hours). We are confident that this will both allow us to focus more time on development while at the same time provide a higher frequency of direct interaction with you, our community. We hope you find this change an improvement! Now, onward to the telethon’s details! As part of the R44 Postmortem, at 7:00 PM CDT, August 7, 2017, we are expiring the following content from the Add On Store (and the in-game Crown Merchants). This means that these items will no longer be available in our store after this date. As a special bonus, we are offering telethon funding rewards to any backer that pledges a minimum of $5 at any time on August 7 from 12:00 PM to 11:59 PM. (Spending Store Credit to make $5 minimum purchase does not apply.) NOTE: We will still stop tracking towards stretch goals at the end of the telethon at 7:00 PM CDT but everyone will have another 5 hours to spend $5 to get the stretch goals. We will be giving prizes away on an hourly basis with many being given away multiple times. If you wish to win prizes during the Telethon event, be in Discord chat! We will be active on Twitch and YouTube chats as well, but they will not be our portal for prize giveaways. We will be answering questions throughout the telethon so submit them in the comments section of the original post here or on Discord chat during the Telethon. Please keep in mind that questions and feedback related to each segment will be given priority and really verbose questions may be skipped, as they can be a challenge to shorten and summarize live on the air. Please keep it to 3 total questions in the comments section below! 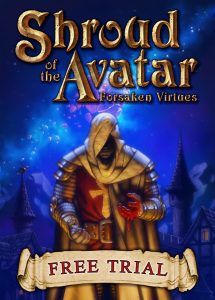 Keep an eye on @ShroudofAvatar for updates before, during, and after the telethon. See you on Twitch at 3pm CT this coming August 7! 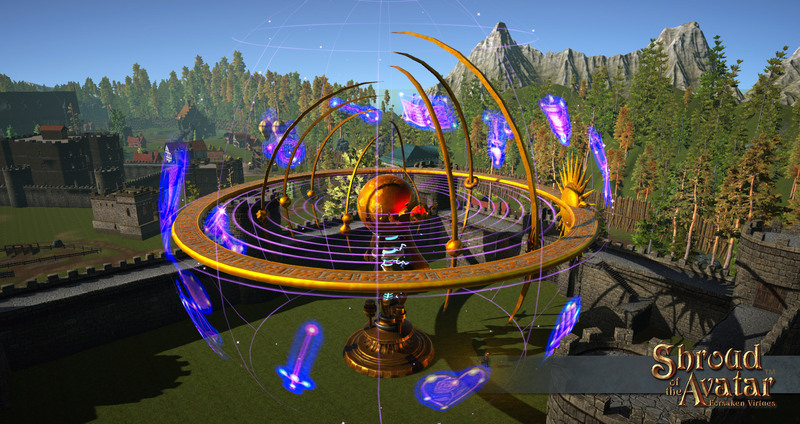 The next test (#5) of our Free Trial system for Shroud of the Avatar will run from August 9th thru the 30th, and will let us continue to gather data about uptake, drop-off, conversions, etc. These tests are invaluable for us in order to improve the New User Experience and the Free Trial System. Get ready to join us in New Britannia for free! Dragon Con has announced even more talks (marked in italics below)! The schedule for the Video Game Track now includes Starr and/or Richard on five different talks! 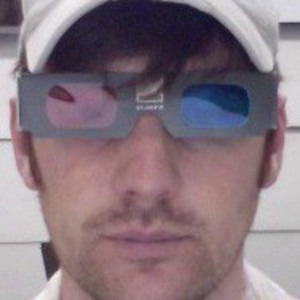 Stay tuned for more schedule updates as Richard is slated to appear on the Space Track, too. Note that we have also added locations to the panels. Future of Video Gaming: What’s next in video games? What new technologies are on the horizon and who’s making it happen? Androids and Automatons: This presentation will cover the history of artificial life from the ancient Greeks to modern automata artists. Techniques for creating your own automata will also be shared. 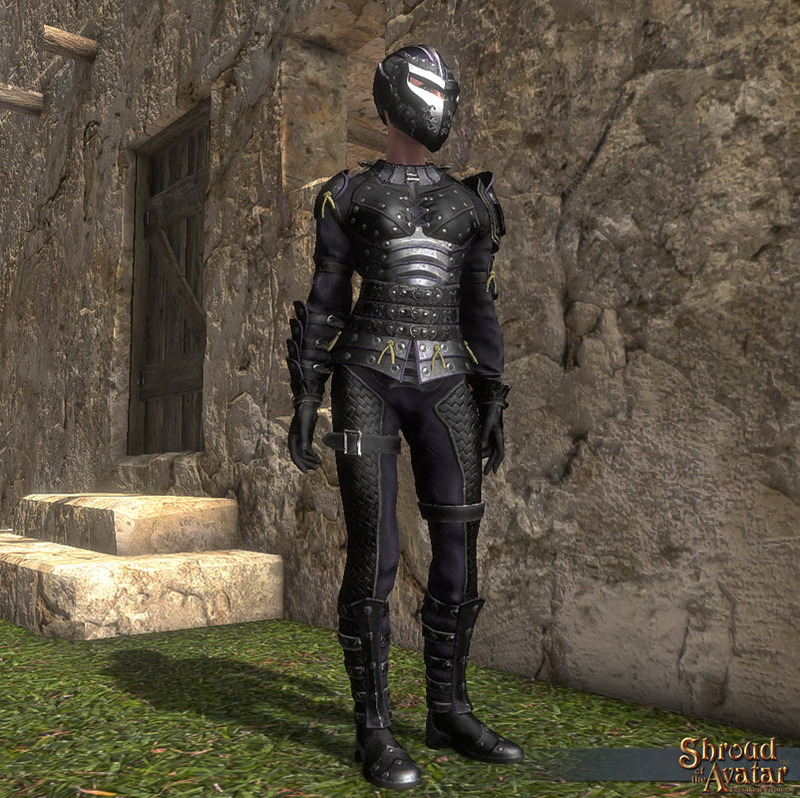 Shroud of the Avatar Q&A: Lord British will provide a development update and host an open Q&A on the current status of his latest project. Avoiding Tropes and Stereotypes: Panelists will identify common pitfalls that lead to boring plot lines and unoriginal characters and discuss ways to avoid them. Crowdfunding – How to Successfully Kickstart Your Game: Join industry professionals who have successfully kickstarted games in a discussion on what worked and didn’t work for them, followed by Q&A. Working with communities has expanded beyond a mere feedback loop between developers and players. In the last decade this relationship has formalized with the growth of Crowdfunding platforms like Kickstarter and marketplaces like the Unity Asset Store. Most recently communities can even gain ownership via equity platforms like Seed Invest. 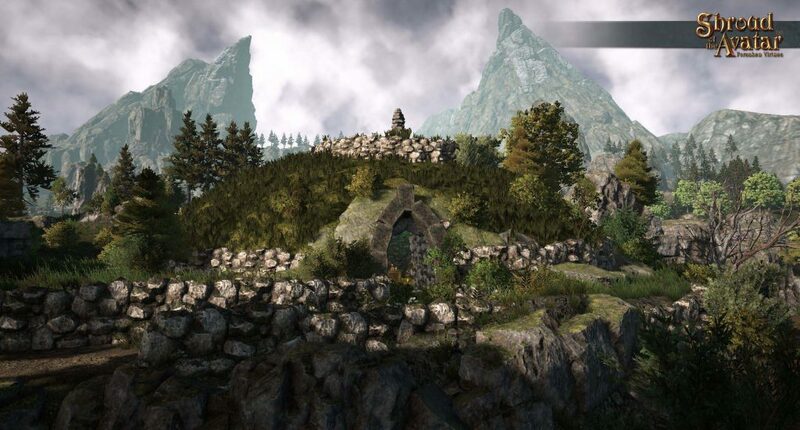 Using projects like Shroud of the Avatar, 25 year game veteran Starr Long will describe this evolution of Crowdsharing and share techniques. If you’re in the Seattle area next month, swing by PAX Dev to meet Starr! Ideate TV: Ideate TV‘s Tiffany Young of interviewed Starr and Richard at Comic Con. IdeateTV host Tiffany Young interviews Richard Garriott AKA Lord British & Starr Long AKA Darkstarr. Tiffany finds out more about how they got into gaming and how Starr worked for RIchard on the Ultima series. 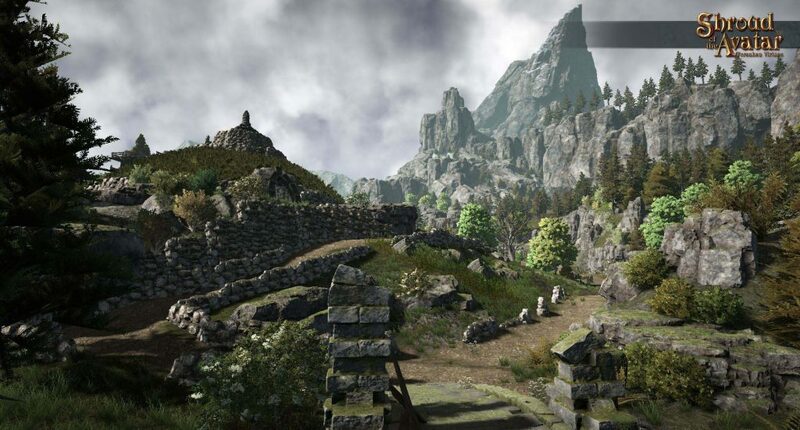 They also talk about their latest project Shroud of the Avatar. “The agreement included a licensing fee that we will allocate as needed between development and publishing,” a spokesperson said over email. 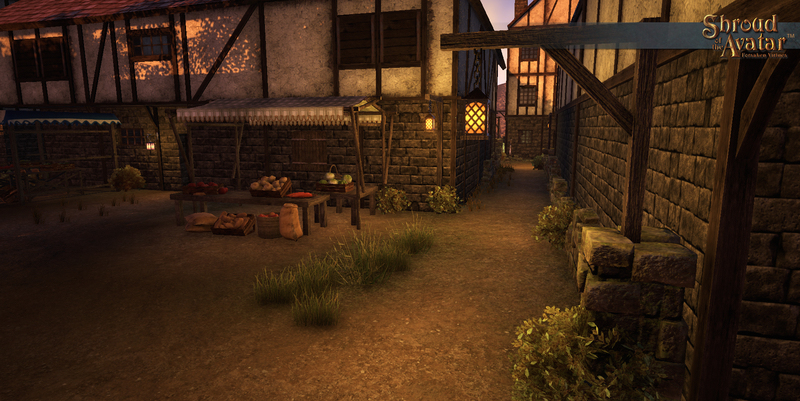 Games in Travian’s portfolio include the railroad sim Rail Nation and Crowfall, another crowdfunded MMORPG. Portalarium is promising a huge world for players to explore and create their own tales in, but it also has a 40-hour main story created by Garriott and noted fantasy author and pen-and-paper RPG designer Tracy Hickman (Dragonlance, Dragonships of Vindras). The studio confirms that it’s complete, and it “includes a series of moral dilemmas and ethical choices” that are a hallmark of Garriott’s work on Ultima. “This is all built on top of a sandbox where players can indeed ‘tell their own stories’ as well,” the spokesperson said. The Travian Games deal also got picked up by a lot of press in Europe (golem.de, GAMESMARKT, JeuxOnLine, 4players.de, GamePerspectives.hr, GamesWirtschaft, and HeiseOnline) and the United States (MassivelyOP, MMORPG.com, MMOexaminer, and gamesindustry.biz). We have exceeded the minimum investment amount and this is your last chance to join Portalarium on a journey from being just a developer to also becoming a full fledged publisher! 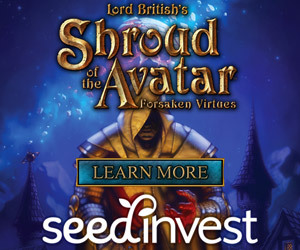 We are currently using the SeedInvest platform to take investments in the company that will make it possible to expand our marketing resources for Shroud of the Avatar and future products. Those of you who’ve made a reservation, please convert it to an investment! To convert, head to the official SeedInvest website, log in to your account, and from there you will be able to complete your investment. You can also go to the above link to become an investor! 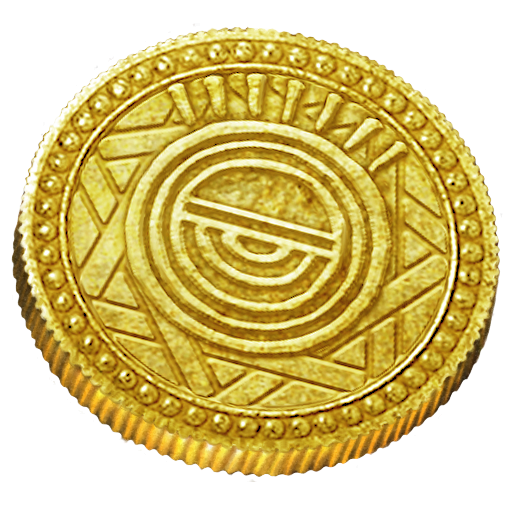 A reminder that there are now several new in-game gold perk additions, including detailed images of the perks, and entire new perk tiers for more investing options. Get those eye popping video ideas ready, Avatars! 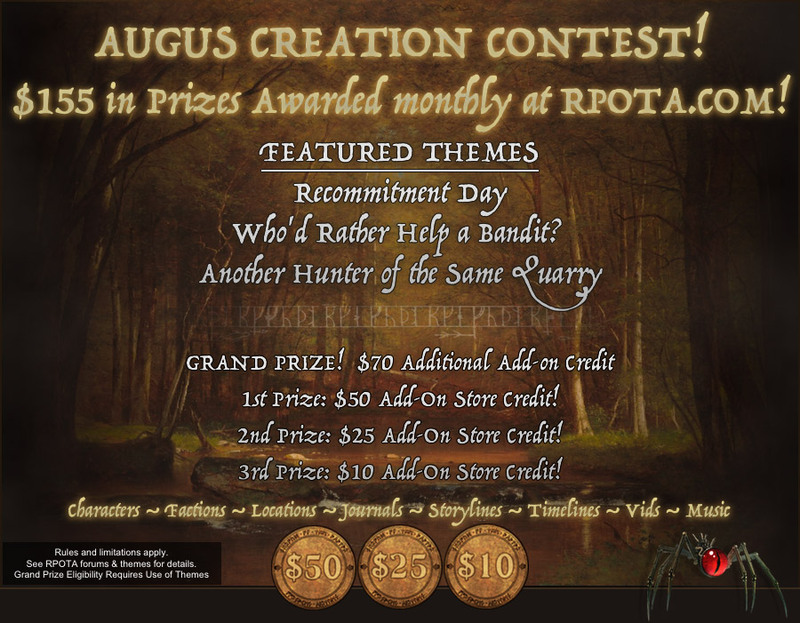 Like last year’s trailer design contest, this is your chance to show that Shroud of the Avatar is both the game, and community, that new players will want to play to launch and beyond. 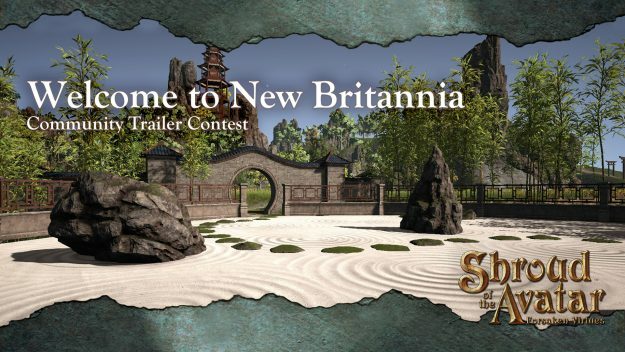 The ‘Welcome to New Britannia’ Community Trailer Contest is in full swing! You have from July 13, 2017 to August 18, 2017 (11:59 PM CT) to design a video trailer for all New Britannians to admire. 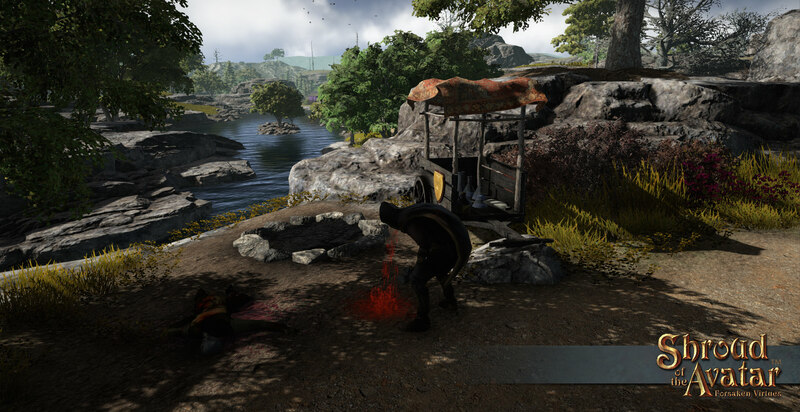 Capture shots of key city districts, bustling player-owned towns, luxurious houses, intense combat, majestic outdoor scenes, crafting of valuable goods, or any of the other amazing features of our game that you think will help sell the game to other players. We kicked off this week’s Community Livestream by celebrating Release 44 at the traditional Dance Party, hosted by Port Phoenix player town in-game! As mentioned in the Summer Telethon Part 1 and Lord British Birthday Telethon, Mad Hatter is excited to be holding the first Shroud of the Avatar Community LAN event! This event will be held on “Mad Hatter Day 10/6” in Chicago. Mad Hatter hopes it will be an annual event, so please join in on the fun! We are a community that comes together by means of a game in a virtual world. This usually happens from all places across the globe. 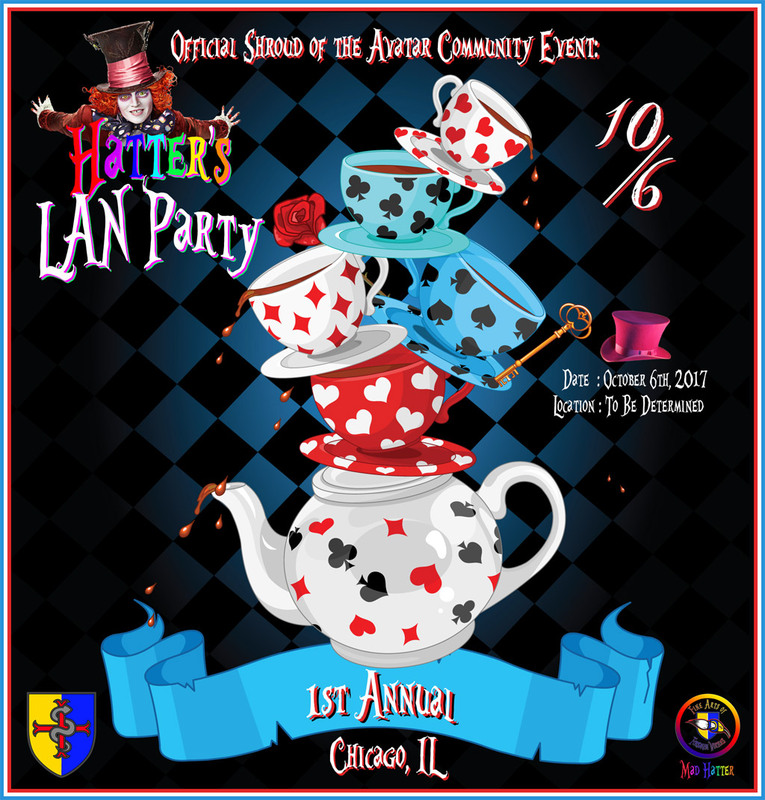 Now this LAN party gives us a chance to come together at one location in the beautiful city of Chicago. Not only will we join the game together live but we will make all attempts to get community member leaders in respected fields to attend the event and give us an inside look LIVE on the giant projected Big Screen. We will also see if Portalarium can attend and support the various topics above. Once upon a time there was a game designer called American McGee who having lived a life of dramatic ups and downs, decided to present a unique creative take on a selection of traditional fairy tales as a Tabletop Card Game, Illustrated Book, Coloring Book, and Collection of Art. He hoped the lessons contained within might help others along their journey through the dark woods of existence. If this project is a success we hope to turn “Out of the Woods” into an ongoing series of games, books, and original art which will explore lessons for overcoming life’s challenges contained within classic fairy tales. 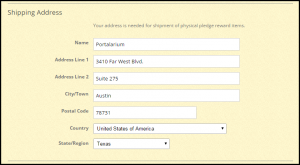 In preparation for shipping backers’ physical pledge rewards later this year, we have added Shipping Address fields to your Account Profile page. To enter your shipping address, log in to the SotA website, select “Account” in top right corner, then select “Edit Profile” located in top left corner, beneath your Avatar image.